To those who have or are in the process of finding the hard part of life are encouraged never to give up in life because God is always with you and keep in mind that you are never alone.This blog is meant to encourage you. God is a wonderful being that was,is and will always be and therefore no problem however BIG it is can challenge him.The farther we peer into space, the more we realize that the nature of the universe cannot be understood fully by inspecting spiral galaxies or watching distant supernovas. It lies deeper. It involves our very selves. Those dreaded tasks hang over my head, though; they make me feel drained and uneasy. possible, rather than allowing myself to push them off. Commandments is “DO IT NOW.” No delay is the best way. times a week, try going every day. source of reassurance, or just moral support. the ready, with no need to run out to the store or begin a frantic search for a sifter. You’re truly ready to begin to work. have _____.” This also gives you the thrill of crossing a task off your list. like doing, push yourself. You’ll get a big lift from it. task! I will write no more until I do it. So how do you differentiate "good and bad" friend? By the way there are no bad friends but some are misleading and add no value in life on the contrary if they do, then they will add failure in your life. But a Friend will stand by you even when you are wrong. With a full news bulletin on his life. "You've been whining about the same thing for 14 years. Get off your duff and do something about it." And stays late to help you clean. Managing stress in our everyday lives is hardly a new issue for millions of us, but in recent years the market has exploded with self help books, gadgets, and stress management classes. Yet despite all these services designed to help our productivity by curbing our anxiety, we are finding it more and more difficult to relax. Why? Blame it on bad news on the job and economic front, increased family and social responsibilities, and constant digital distractions. Believe it or not, bringing ourselves "back to basics" can help alleviate our stresses more effectively than any expensive massage chair or herbal supplement can. Here are a few tips to help bring back the calm. Schedule breaks from digital distractions. Cell phones, email, text, and social networking sites can be fun and convenient, but all of these services allow us to be constantly available to others. To ensure a little down time, limit the number of times per day that you check your email, and set limits on when you will be available for calls or text messages. Check your breathing. When we are under stress, we tend to breathe shallowly. Take a minute to really concentrate on your breathing; take a deep breath and exhale slowly and steadily. While you are exhaling, imagine that you are blowing the petals of a flower ever so softly. Try journalism. The problem with worry is that it can run rampant on our thought processes; we simply don't know when to quit. Focus your thoughts by writing down a few specific worries and possible solutions, and then close the book on your anxiety. The rewards of successful stress management will be immediate. Your health and mood will improve, and you will be able to organize your life more effectively. Here's to a calm and peaceful day ahead! 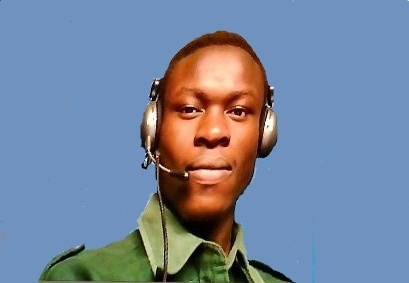 Fredrick Omondi is a graduate from Technical University of Kenya with proficiency in Technology in Communication & Computer Networks; School of Computing and Information Technologies, Department of Computer Science and Technology under Faculty of Applied Sciences and Technology. "When life knocks you down, try to land on your back. Because if you can look up, you can get up." "It's not what happens to you, but how you react to it that matters. "Life is tough, but you must be tougher." fredrick omondi 2011. Picture Window theme. Theme images by enot-poloskun. Powered by Blogger.